"What's that on Kiyoshi's shirt?? Indeed Kiyoshi will be the MOST AWESOME BIG BROTHER!!! We roughly twelve weeks pregnant!! Thank You Lord for this precious and amazing gift and blessing!! Thank you all for your love, prayers and support!" 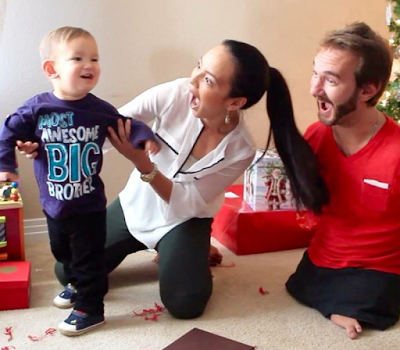 Nick Vujicic, born without arms or legs, never thought he would find love. But, God blessed him with a wonderful wife who loves him for who he is and faces every challenge he does by his side, a cute son, Kiyoshi. He shared his testimony here.